A mobile-compatible, interactive eBook with embedded lecture videos, animations, and problem solving videos. 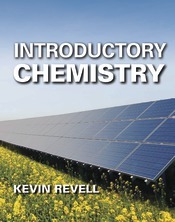 Lecture Videos created entirely by Kevin Revell, covering all content from the written text so students can watch videos instead of reading and instructors can easily flip their classroom. Try It, Check It, Watch Explanation videos that explain the solution to every in-text practice problem. Guided Inquiry tutorials and activities that allow students to explore chemical principles. Guided Practice online tutorials offering extra, hands-on practice with the most difficult concepts in the course, as well as a foundational understanding for future work in chemistry. Multiple question types that enhance student engagement and understanding. Hints, targeted feedback, and detailed solutions for all study questions to ensure student learning. Industry-leading peer-to-peer support that pairs each instructor with a fully trained PhD- or Master’s-level colleague, ready to help with everything from quizzes and assignments to syllabus planning and tech support.